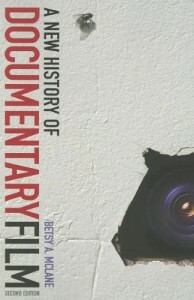 By Betsy A. McLane Ph.D.
Frederick Wiseman’s body of work is unique among U.S. documentarians, at the same time that the films offer some of the best representations of the ways in which the nation typically operates. His films are the most striking record that we have of the past forty years of American social life. Born in 1930, and living almost entirely near the New England city of Boston, Wiseman is not a “baby boomer”, yet was too young to fight in WWII. He trained as a lawyer, and brings lawyer’s precise brilliance to his subjects. His adult experiences are of postwar America, and his films, particularly the first three decades of films, can be interpreted as a kind of highly secular canticle of Cold War distrust and suspicion. Wiseman has been granted entrance to the inner workings of arenas which range from department stores to meat packing plants and from social welfare offices to elite resort communities. In every case he has produced a formally analytic film that, as far as is possible, allows events to unfold in their own fashion. Over 30 titles dealing with places and institutions, and the ordinary people who inhabit them, represent the most sustained investigation that we have of how Americans interact with their own social structures. Wiseman is also the filmmaker who has remained most true to the observational style of cinema verite/direct cinema. From the first film, TITICUT FOLLIES (1967) to the most recent, THE GARDEN (2005), he has stayed resolutely behind his equipment, never injecting an image, a question to the subjects, music, narration or self-reference into his films. While no one today-including Wiseman-argues the possibility of unbiased cinema, he has chosen to remain out of his pictures, allowing audiences to find their own way among his sounds and images. TITTICUT FOLLIES remains, along with HIGH SCHOOL (1968), perhaps the best known of his work. This is as much due to the controversy and subsequent 30-year legal ban on screening the film, as it is to the sometimes-shocking expose of patient care conditions in a mental hospital in the state of Massachusetts. With TITICUT FOLLIES Wiseman established a method of working which he follows to this day. A cameraman, one assistant, and Wiseman doing sound are the only crew. Wiseman does all of his own editing. After receiving permission to film, he approaches the situation and almost immediately begins to shoot. He does not spend time befriending his subjects, nor does he hang out seeking to integrate himself into the milieu. Working in 16mm film, Wiseman directs the shots and moves with the camera, most often carrying a boom microphone. He has worked with only five cameramen in his career. Shooting anywhere from 75 to 120 hours of film for each project, Wiseman stays within the boundaries of a specific institution or place for as long as he feels is necessary to capture the material he wants. A year or more of editing is required to find within this mountain of footage the essence of the completed film. Wiseman crafts demanding works that range from 1 to 6 hours in running time. The films do not quite create stories, although the everyday activities of many people are shown, and certain characters come to the fore in each project. Unlike other first generation US verite documentarians with whom he is often lumped (Robert Drew, DA Pennebaker, Ricky Leacock, Al Maysles), Wiseman’s films do not follow one person or small group of people through a problem or personal drama. There is no discernable story arc. In a sense, it is not the individual, but the place or the institution that is the “star.” For some critics this has made the films cold and dry, and audiences are known to complain about the process of watching a very long film only to have it end with no definite resolution. Although the films may not satisfy a desire for drama, they offer deep cinematic rewards and special insight into complex issues. Wiseman’s films are unique in another significant way. He has always worked with public television and has been fully funded by them to create his own work, yet Wiseman retains absolute personal control over every frame. All of the films are shown nationally on public television. Thus Wiseman does not have to constantly look for funding, nor does he have to change anything to suit a funder or distributor. He also retains all rights, other than the PBS broadcast, for his titles, so if one want to see the films, one has to deal with Wiseman’s company directly. No other American documentarian is in this enviable position, and it is one that Wiseman has held for his entire career. Wiseman observes and selects, in the placement of the camera and in the editing of picture and sound, and the result is an almost pointillist effect. Like such paintings, the cumulative result of many discrete images emerges only when the viewer steps back from the piece. The films are demanding, but well worth the effort it sometimes take to appreciate them. They exist as a compelling and illuminating record of America and it is a genuine treat for DocPoint to be able to offer this retrospective.